The LMA catalogued opening responses to the issues before the assessment committee. LMA described the Urban Design Framework as a forward-looking document that will inform how future decisions are made: so if future decisions are considered to depart from or fail to meet UDF objectives, then people can seek remedies at VCAT. LMA appeared to suggest that EWL will be an iconic road project like, for example, Sydney Harbour Bridge (pretty photo provided on screen). Roads like St Kilda Rd, Royal Pde, Victoria Pde can be viewed as “cultural and visual landmarks as well as vital pieces of city infrastructure”, we were told. Moving on to noise impacts of construction: these are well understood and there is nothing to suggest that they won’t be well managed using well-established methods like noise walls and enclosures. When the project is completed, some noise will be worse, eg Manningham st and in Royal Park, but it will be greatly reduced for those near tunnel, LMA argued. Any vibration resulting from the project is highly unlikely to cause structural damage, and overall regional air quality is likely to improve. Just on air, the LMA reminded the committee that their role is to consider if air will be appropriately managed in context of relevant planning criteria. Their role is not to assess what those criteria should be. Groundwater: it is acknowledged the tunnel will have an underground damming effect – “by no means a potential problem peculiar to this project” and very unlikely to cause problems that can’t be managed. As for contaminated runoff from construction, these risks are well understood and can be mitigated, we were told. Subsidence: mitigation measures will be determined by type of tunnelling method used – of course we won’t know that until the tenderer is chosen. And finally, in response to the matters raised in the morning: Yarra is wrong – there are plenty of benefits discussed in the CIS; and LMA is entitled to table documents at short notice if this is done to defend its case against submitters. Tomorrow – we start hearing from the experts. Our bloggers are settling in for the long 30 day hearing ahead. 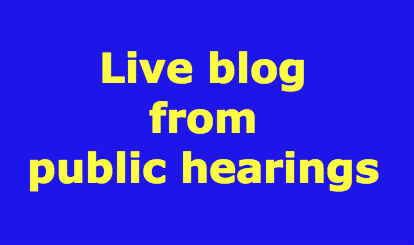 There are many helpers watching the hearing and bringing you these updates. Here are the significant observations from the afternoon session. Morris for LMA said that Royal Park is crown land and any impacts resulting from the East West Link are confined to western section and “affect less than one percent of the park”. He added: “…..the Parkville heritage precinct is largely unaffected and Royal Park itself is largely unaffected”. LMA, Morris said, has made a substantial financial contribution to City of Melbourne’s efforts to work with affected sporting clubs. Morris confirmed that LMA will consider requests for voluntary acquisition of land from residents outside the project area on a case by case basis only, but the assessment committee may refer cases to LMA based on submissions received which they think have merit. Before lunch we watched 3D simulations of the East West Link complete with shadow diagrams and measurements. We saw that the viaduct will run 37 metres from 120 Racecourse Rd and 105 metres from 126 Racecourse Rd. We watched the sun cast long shadows over the Flemington Community Centre. Now we are talking traffic – an overview of LMA’s position ahead of expert evidence to come in the next few days. Nick Tweedie SC tells us there “can be little doubt that project would achieve its objective” of improving road-based transport connectivity between the east of Melbourne and the Port of Melbourne – as well wider Melbourne and the State. There is “really nothing in any of the expert evidence … that takes issue with that proposition,” he says. Again we are referred back to the Eddington study and told it “clearly identifies what the problem is and the costs of not addressing the problem”. Tweedie says it is “not incumbent on CIS to reproduce Eddington or prove again what has been comprehensively proven in Eddington”. Freight travel and increases rate a mention … and an indicative illustration of proposed built form for Arden-Macaulay which is said by Tweedie to be compatible with Part B of the Link. And that’s traffic for now. The reality is that planning amendments have a dull side and legal submissions on the topic are sometimes a little sleep-inducing. None-the-less, we were woken at 12:30 when Morris argued there is limited protection for native vegetation in Royal Park. Even the City of Melbourne’s recent Environment Significance Overlay to protect ‘exceptional trees’ “will have no effect whatsoever on the operation of the existing controls”. Heritage controls “do not apply to trees within the Park” and the overlay “does not apply to any part of the proposed project”. Morris also reiterated the point made by the Chair on day one that Royal Park’s nomination for inclusion in the Heritage Register “is of no consequence” to the committee’s deliberations. None of that is unexpected. Now time for Urban Circus to take us into lunch. Andrew Herington raised questions in the morning session about Urban Circus’ input. He asked whether the presentation forms part of CIS? In relying on this in evidence, does Urban Circus model become part of the presentation and CIS? Can community groups criticize it? We didn’t get an answer – just a presentation. Commencing the LMA’s submission, Morris delineated several key arguments. 1. There is no scope for the Project to be modified outside the project boundary. The Chair and panel members questioned Morris on this point: “clearly there will be impacts outside the project boundary,” said the Chair. Can the Panel make recommendations beyond the freeway alignment? Morris contended “the alignment of the freeway has to be limited to the project boundary”. “Further refinements are possible” but “we will get an outcome that resembles the reference project in many respects”. 2. Secondly, Morris argued the committee should proceed on basis that performance requirements “will be required as matter of contract” and that Yarra was incorrect to argue the style of the performance requirements limits the committee’s capacity to assess the project’s impacts. 3. And the committee is not a court, and rules about submissions and documents should be flexible: “if someone wants to rely on a document, by all means they should be able to”. Morris commented that submitters who may stray outside the terms of reference should be heard, and then irrelevant comments should be disregarded: “Any person can come along and have their say,” he said. But, he argued, the same latitude, should apply to the LMA. Counsel for Yarra, Adrian Finanzio, is mounting a challenge to the introduction of additional information by the LMA. He says essential information has been omitted, including evidence to support positive economic impacts, and that new information has been brought to the committee outside of the exhibition and submission process. He argues the LMA “has filed witness statements which respond” to submissions and that if the evidence is accepted by the committee it “should have been part of the CIS”. He argues Pelosi’s transport evidence should not be allowed because it simply parrots the conclusions in the CIS without explaining these further. Moonee Valley agrees. Fairfax reporters Adam Carey and Clay Lucas covered day one comprehensively here. Late on day one, counsel for LMA, Stuart Morris QC, commented on the origins and motivations of submitters in ways that angered the submitters present. A map identifying the geographical locations of submitters was presented and Morris commented on a cluster of submitters in Collingwood. Morris said that no objections had been received from the Arden Macaulay precinct east of CityLink. As many community submitters are aware, the precinct directly east of CityLink in the Arden Macauley precinct includes no residences and includes a swathe of vacant land – so a low reporting level from this precinct is not unexpected!